A landmark on the River Nile, the Conrad Cairo hotel is an oasis of calm in the heart of Egypt's bustling capital. 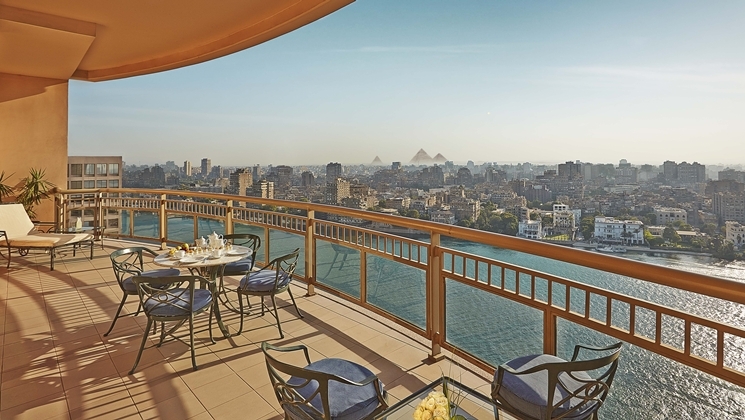 The Conrad hotel in Cairo enjoys a spectacular position in Egypt's capital city, overlooking one of the area's most popular attractions, the River Nile. The hotel is in proximity to a wealth of bustling shops, cafes and fascinating historical sites in one of the largest cities in Africa and the Middle East. Extensive amenities include an on-site health club featuring the latest fitness equipment, steam rooms, saunas, massage services and heated swimming pool. Hotel boutiques, florist, beauty salon and shoe shine are also available for your convenience. Rooms are decorated with comfortable and elegant furnishings with spectacular River Nile views from the private balconies. Explore six elegant dining options and 24-hour entertainment with a glamorous International Casino. Discover the antiques and artifacts in Cairo's Egyptian Museum, or venture out to the Giza Pyramid, the last standing Wonder of the Ancient World. Take a camel ride and marvel at the great Sphinx for a truly Egyptian experience. Conrad is located near the city's commercial districts and only 45 minutes from Cairo International Airport - an ideal hotel choice for business travelers. Guests have access to secure parking and valet.